We have all been on a flight with crying babies. Heck, I’ve been the mom with the baby who cried the whole flight. And let me tell you nothing is more embarrassing than not being able to make eye contact with your fellow passengers because your child wouldn’t stop crying. There are many reasons why kids cry on an airplane. For little ones, it is unfamiliar and the pain of the pressure changes can be irritating. 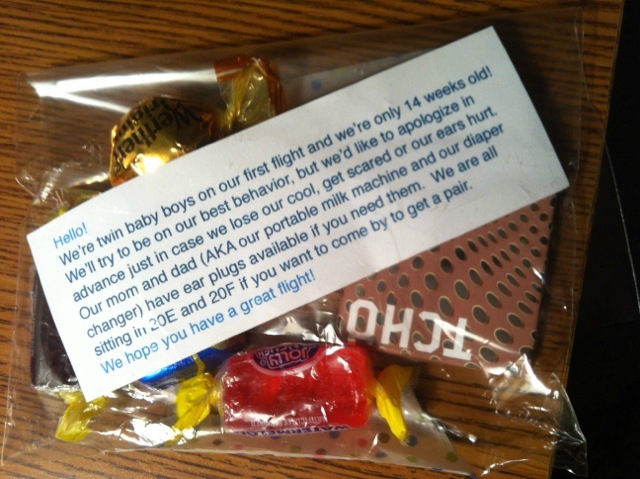 Not wanting to take the chance of getting the stink eye from their fellow air travelers parents of twin boys opted to give each co-passenger a gift bag explaining that they were flying with little ones, who were first timers. The image that has gone viral shows the bag of goodies and the printed note everyone received as they boarded the plane. The parents were fantastic and the kids were better than would be expected. mom was super nervous and obviously very tired, but still extremely nice to everyone around her. Not a mean or frustrated word from dad either. Saw them meeting his parents at baggage, who were seeing babies for first time, and got a bit teary. They have definitely raised the bar for the rest of us traveling parents!